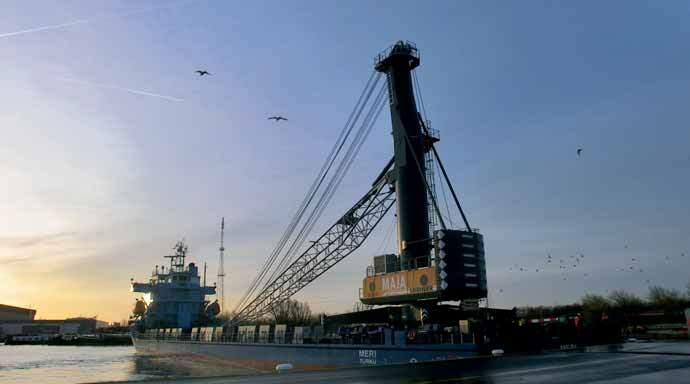 Established in 1972, Maja Stuwadoors Group B.V. (Maja) is well-known for valuable expertise in loading and unloading of bulk goods, operating a fleet of seven floating cranes in various ports. In view of increasing business, the company has opted for its first Liebherr mobile harbour crane, type LHM 550, in order to upgrade its facilities. Providing a maximum lifting capacity of 124 tonnes and an outreach of up to 48 metres, the crane is equipped with two winches for highly efficient scrap handling. In four-rope grab operation the maximum lifting capacity is 75 tonnes and more than 40 tonnes at 43 metres outreach. In February 2014 the new crane for Maja rolled-off at Port of Amsterdam. “The LHM 550 significantly increases our scrap handling capacity. Moreover, our portfolio comprises many other materials and thanks to its flexibility the new machine can be operated wherever it is required, especially in peak times. For that reason, our customers will also strongly benefit from this investment,” said Arie Holleman, director at Maja Stuwadoors. The short timeline of the project is remarkable. In late November, Maja Stuwadoors and Liebherr were in touch for the first time. After negotiations in December, the contract was signed in January. Manufactured and tested in Rostock, the crane was delivered fully assembled, just one month after signing. Right after rolling-off the barge, the crane was ready for operation mid of February. “Business is on the rise and fast delivery was very important for us. The close and professional collaboration between both partners was impressive and facilitated a short delivery time,” added director Marco Holleman. Before the LHM 550 moved its first load of scrap, Maja’s crane drivers were well instructed on site. This practical training comprises operational topics as well as safety features. Maja Stuwadoors attaches great importance to well-trained crane drivers in order to maintain its high quality standards regarding damage- free and fast scrap handling.